David Babaii is a well known celebrity stylist who actually styled the gorgeous Gwenyth Paltrow's super sleek hair at the Los Angeles movie premiere of Iron Man 3 a few weeks ago. David Babaii has his own revolutionary hair styling product line and I was fortunate to be given the opportunity to trial one of his hair products. I was sent the David Babaii Polished Creme Serum (A$24.50/50ml) which is used as a finishing touch to styling super sleek hair, smooth a ponytail or even help to smooth the hair to create an up-do. 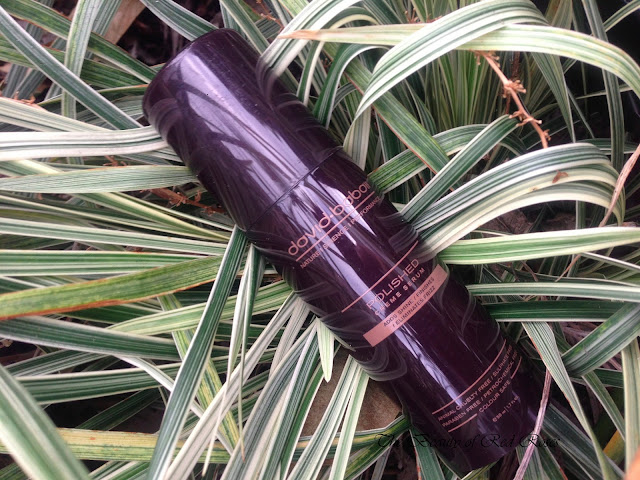 The primary purpose of David Babaii's Polished Creme Serum is to add shine, tame fly-aways and eliminate frizz. David Babaii hair products are animal cruelty-free, sulphate-free, paraben-free, petrochemical-free and colour safe. David Babaii Polished Creme Serum is a lovely lightweight creme which contains minuscule shimmers which help to boost shine to the hair. The pump of the bottle helps to allow easy dispensing to obtain the desired amount of product and typically I only need about a 10 cent coin size amount for my medium-length hair. My hair feels ultra smooth, weightless and silky soft to touch. It's a lovely feeling for my hair and flyaways are nowhere to be seen. My hair also feels nourished, strengthened and protected due to the lush blend of natural extracts of Nettle, Orchid, Cucumber, Oat and White Ginger and also hydrates and moisturises my hair thanks to the ingredients Moringa Oil and Phyto Stem Cell extract. I absolutely LOVE the coconut and floral scents of this creme and it gives my hair a subtle hint of delightful-ness after applying to my heat-styled hair. It's not only a great creme serum for straightened hair, but it's also fantastic to use after curling my hair as it tames flyaways and reduces the amount of frizz I tend to get from using heat styling products. The frizz in my hair does not completely disappear when curling my hair, however, this creme serum does keep my hair looking shiny and feeling beautiful! Have you used David Babaii products before? Does your hair tend to appear frizzy? Which products have you used to tame flyaways and eliminate frizz? Product was provided for consideration only. This review is 100% based on my own thoughts and opinions. I am not affiliated with David Babaii and did not receive remuneration to post this product review.